Swahid Kushal Konwar Civil Hospital, Golaghat. 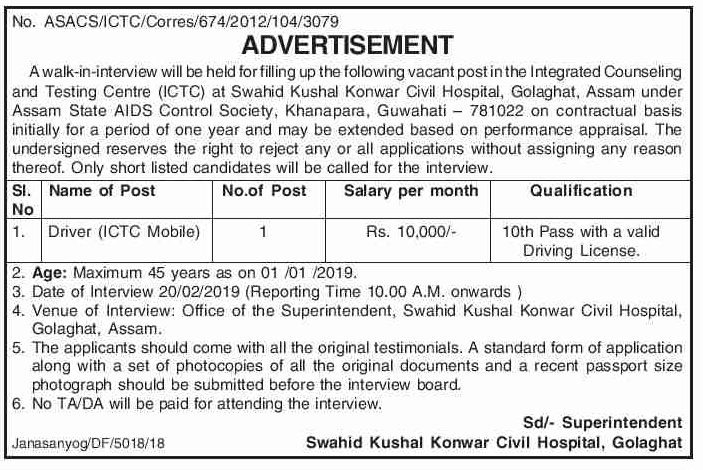 A walk-in-interview will be held for filling up the following vacant post in the Integrated Counseling and Testing Centre (ICTC) at Swahid Kushal Konwar Civil Hospital, Golaghat, Assam under Assam State AIDS Control Society, Khanapara, Guwahati — 781022 on contractual basis initially for a period of one year and may be extended based on performance appraisal. Educational Qualification: 10th Pass with a valid Driving License. Age: Maximum 45 years as on 01 /01 /2019.